The meeting of photography and painting is dangerous ground. The two mediums are utterly different and are assessed and understood in completely different ways. One medium implies time while the other captures it and the creation of the illusion of light and space on a two dimensional surface are achieved in utterly opposed processes. Avoiding the disaster that can occur when a painter directly translates a photograph on to canvas is a challenge that very few artists can achieve. Painters such as Jason Benjamin are brought down by the horribly compressed perspective distortions of one medium going into another space. We’re not sure what the problem is but it’s hard to escape. Some much more clever artists such as Lily Hibberd have taken that process of transfer as the very subject of what they do and instead of trying to obfuscate the translation the work celebrates it. The best thing that can happen when painting and photography meet on canvas is that the artist can use the casual recording of light and space that is particular to a camera and imbue it with the timeless suspension that painting can accomplish. Halinka Orszulok, Park Steps, oil on canvas, 75x52cms, 2004.Courtesy MOP Projects.Halinka Orszulok’s show Unhomely at MOP Projects is six oil on canvas works that depict suburban night streetscapes. Now we’re just guessing that Orszulok has used a camera because the works have the unmistakable flatness of the lens but where these works succeed is in the sheer spookiness of the images. 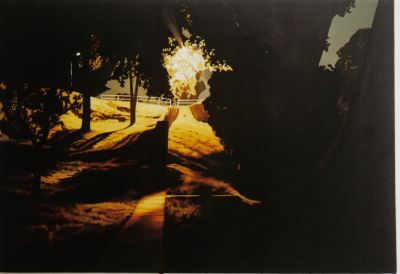 Nightscapes are what the artist calls ‘uncanny nocturnal suburban environments’ and the familiarity of the locations adds an interesting point of uneasy familiarity to the hidden lights, empty windows and dark trees. One looks just like the house across the road! Ahem. Showing in the big space at MOP is Special Affects by Cash Brown and Adam Cullen. Now, a couple of week’s back we mentioned a Cullen that was included in Unwritten at the Art Gallery of NSW. We had used the word ‘typical’ in that the work had many of the artist’s hallmarks – text, paint splodges, monster faces and so on – and this prompted one eager reader to claim that Cullen’s work was now just a formula. You know how it goes, one minute you’re doing Cubism and then it’s all trademark eyes on the side of the heads and it’s all down hill from there. Maybe it’s because that kind of work was the stuff that Cullen was best known for but anyone who had gone to his gallery exhibitions at Yuill/Crowley over the last few years or paid any attention to what he was doing in his Archibald entries would see that that ‘typical’ work is now a thing of the past. One need only check out this new work that Cullen and collaborator Brown have installed. No text, no monster heads, not even any paint on canvas and a hand made book on sale for $30. Typical? Hardly. Have a look.